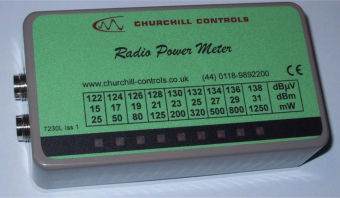 The RPM has two TNC connectors, allowing it to measure power in-line, or into a dummy load. It actually measures the voltage across its terminals, but displays the level as power into a load impedance of 50W. It measures power levels from 15…31dBm in 2dB increments, but the scale also shows the power in watts and in dBµV. The unit is self-powered, and does not require calibration. It is supplied with two leads and a dummy load.